Classic Kidz Laura from Gotz is a 50cm tall brunette. The Classic Kidz collection is made in limited numbers. She's artist designed by Hildegard Gunzel and suitable for play for children of age 3 and over but also very popular with collectors who understand the beauty and value of a special Gotz doll. Laura's a natural beauty with a fresh complexion, long eyelashes and sweeping long brunette hair parted slightly off centre to the left. Her healthy glow, painted feathered eyebrows and lushious lips give her a beautiful face. Her body is vinyl and as well as joints at the shoulders, hips and neck, her limbs have elbow and knee joints so that she easily participates in activities such as tap, ballet and horse-riding. 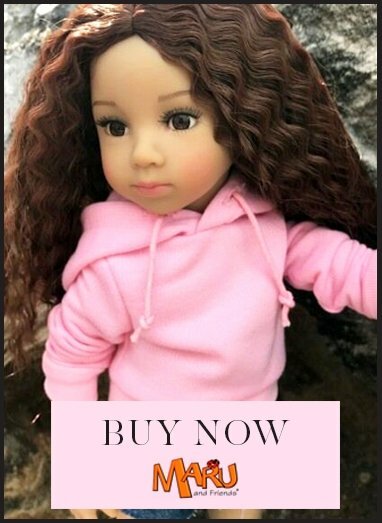 Laura is safety tested for children from age 3 but My Doll Best Friend recommends her to girls age 6 and above, as her jointed vinyl body can be tricky to position for younger children. The Happy Kidz body is modelled on a typical 10-11 year old girl. Gotz's high quality, real looking hair, is durable enough for washing, combing and styling. The My Doll Best Friend hairbrush is excellent for detangling without damaging the hair. The clothes and accessories on this website fit Laura, unless otherwise stated. Laura is not wearing knickers but knickers can be bought separately. Her feet are slightly larger than 456m / 18" dolls, so she has her own footwear category, under Footwear for 50cm (19.5") Dolls, so choose from there to be sure to find something to fit her!